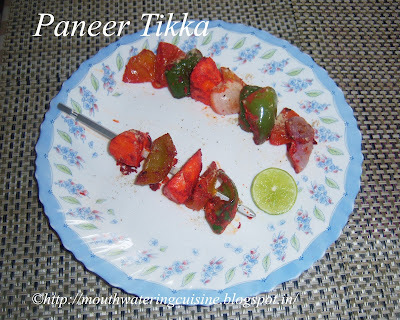 Paneer Tikka is a North Indian starter dish. We get this as a starter in almost all restaurants. 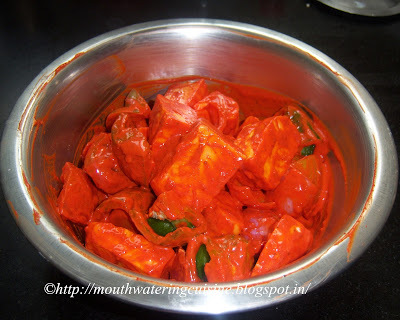 It is made with chunks of paneer marinated in spices and grilled in a tandoor. Many of us may not have tandoor at home, but we can try this on a non stick tawa on stove top or we can cook it in Convection Mode Microwave Oven also. I bought a nice cook book long back. I found this recipe in it. But at that time I do not have oven so could not venture to give a try. 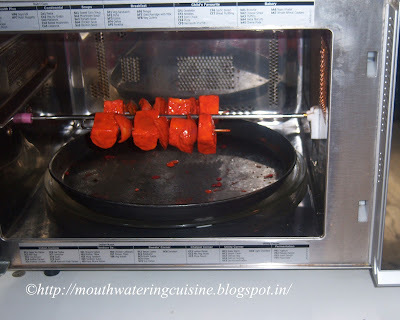 Later when we bought LG Convection Mode Microwave Oven, I tried and it was awesome. Every one in my family liked it very much. My son and daughter would always love to share it with their class mates. So I will make it for their snack box. P.S. : Sorry for not posting proper and nice photographs, I have taken them long back and they are not properly clicked also. Next time when make it again I am sure will take good care of clicking them. Bear with me for this time. Home made paneer is better than store bought one for this recipe. Cut all the vegetables and paneer into square shaped cubes. Keep them aside. Tie curd in a muslin cloth and leave it hanging for 15 mins so that excess water from it gets drained. Meanwhile mix all other ingredients except lemon juice, vegetables and paneer in a large bowl. Add the curd and mix well. Combine chopped vegetables, paneer pieces to the curd mixture. Mix them well so that all spices and curd fixes to the vegetables and paneer. Let it marinate for an hour. We can put it in refrigerator also. Insert paneer and veggies alternatively to the skewer or to toothpicks. I used the rotisserie bar given with the oven. Turn the oven to grill mode. Fix the bar in the oven and bake them for 10 to 12 mins at 180 degrees. If using skewer or toothpicks, Place them on a greased non-stick tawa. Put it on high rack and bake them for 10 to 12 mins at 180 degrees. Turn sides once in between. Remove from the bar and arrange the tikka in a serving plate. Sprinkle little chaat masala and a drop of lemon juice. 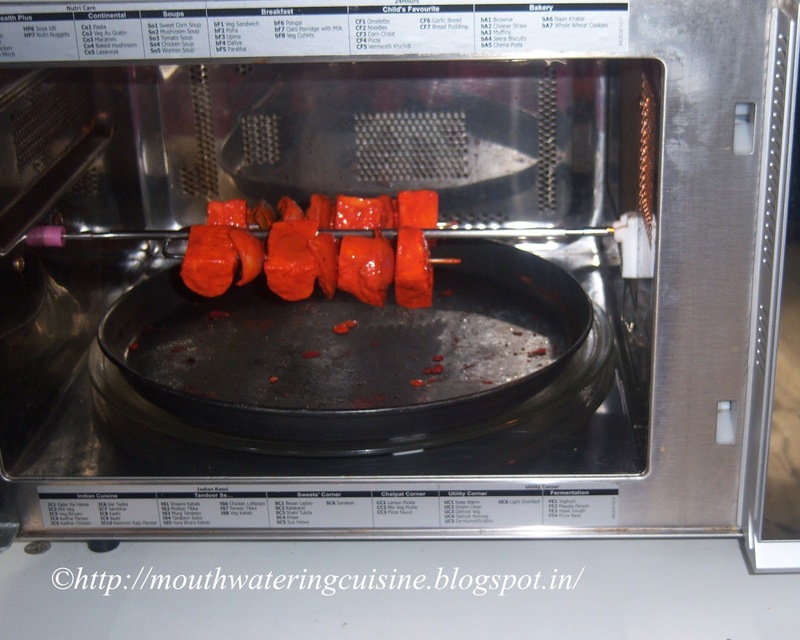 Serve Paneer Tikka as a starter along with onion rings and a piece of lemon. It can be cooked on stove top also. Place roti grill on stove top and cook them on low flame. I never tried this way though. For more sweets and snacks click here.